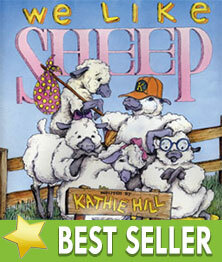 We Like Sheep : Kathie Hill Music, LLC, Making music with and for kids for over 25 years! We Like Sheep books are digital products and can be downloaded as soon as your payment has processed. All other companion products are physical and shipping charges apply. Released in 1987 We Like Sheep has become a children’s classic for each new generation of children to learn and sing about the love of Jesus, our Good Shepherd. Based on the parable of the 99 sheep, We Like Sheep follows the antics of Grimey, who leaves the flock only to realize that the Good Shepherd will leave the 99 just to find him. As the remaining Ewes and Rams reflect on the Jesus love for them, everyone learns that “No matter how baaad we are the Shepherd loves us” and celebrates when Grimey is brought back into the flock. In our performance the Kindergarten students spoke all the lines while Pastor was our shepherd. This musical is well suited for K-3. An aside; one of our Kindergartners was in the thinking chair outside the classroom yesterday. I could hear him singing softly "No matter how bad we are the shepherd loves us." Thank you, Kathie! We Like Sheep was the perfect choice for us as a smaller church with younger members. The kids really loved the upbeat music, and funny lines. It also requires minimum staging and props, which was a perfect fit us. From a teacher's standpoint, you could not ask for a clearer presentation of the gospel for either the kids in the performance or those they are performing for! The Christian school my daughter attended and where I worked, did this musical and it was a HUGE hit! The children loved it, the adults loved it, and most importantly, it reached into the hearts of many unsaved who attended! THANK YOU, Kathie Hill for your wonderful ministry!! Kathie’s Note:So simple in both song and dialogue, few musicals communicate the gospel as well as this one. I am always amazed at how effective this work is in presenting Jesus as our shepherd and savior in churches large and small and with children young and old. Downloadable 3x licensed digital pdf of all songs, script, production notes & piano transcription with permission to make 3 copies. Additional copies require purchase of additional 3x license/s. Paper sleeved CDs of complete musical with all songs and dialogue.